Sustainable Agriculture Development Programme (SADP), a project by cigarette producer Ceylon Tobacco, has celebrated another milestone when 1,000 families from Kilinochchi graduated having completed the programme. A farmer and an official. SADP is the flagship CSR programme of CTC which the company in a public statement says is moving towards alleviating poverty. The successful completion of the 30 month programme means that families are now able to adequately meet their daily nutrition levels and also able to receive an income from selling any excess produce. Their knowledge on agriculture and land productivity has also greatly improved and the families are now able to sustain their home gardens without the support of SADP Field Officers, the company said. 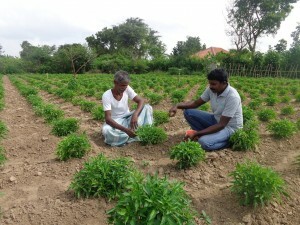 Farmer families were registered for SADP Plus in 2012 with the opening of a SADP office in Kilinochchi with a Project Manager and five Field Officers. As a programme with a strict policy of ‘No Cash Hand-outs’, SADP strongly believes in sustainable agriculture development through knowledge transfer, resource assistance and a paradigm shift in attitude among the rural communities of Sri Lanka. As such, a Field Officer was assigned for every 200 families, who would visit them at least once in 10 days to evaluate their progress. During the 30 month programme, a total of 1,534 cluster meetings were held with the participating families by these Field Officers to educate and share best practices in farming.Furthermore, a total of 20,000 vegetables and fruit plants, 16,144 chicks, 266 goats and 100 bee boxes were issued to the families. A selected group of families were also trained and supported in mushroom cultivation. SADP also provided families with water buckets and polythene bags to maximise and preserve water needed for farming. This ensured that despite only 12.3 per cent of the families having sufficient water for farming, during severe drought 40 per cent of the families succeeded in sustaining their home gardens, Ceylon Tobacco said. What the SADP beneficiaries all have in common is their ambition to rise above poverty and create sustainable livelihood for their families and themselves. CTC ensures that they provide the knowledge and guidance to accomplish their ambitions.